At the end of this past term, I said good bye to a student, a friend, whom I will dearly miss. It has been such a pleasure watching Andi’s progress as a craftsman at the school. More than two years have passed since Andi suggested to a friend he was looking for a place to train in our craft. His friend replied, “my sister is teaching at a school in Canada, you should look at that school.” Michael, Caroline’s brother, visited us shortly after and we sent back a copy of A Cabinetmakers Notebook. 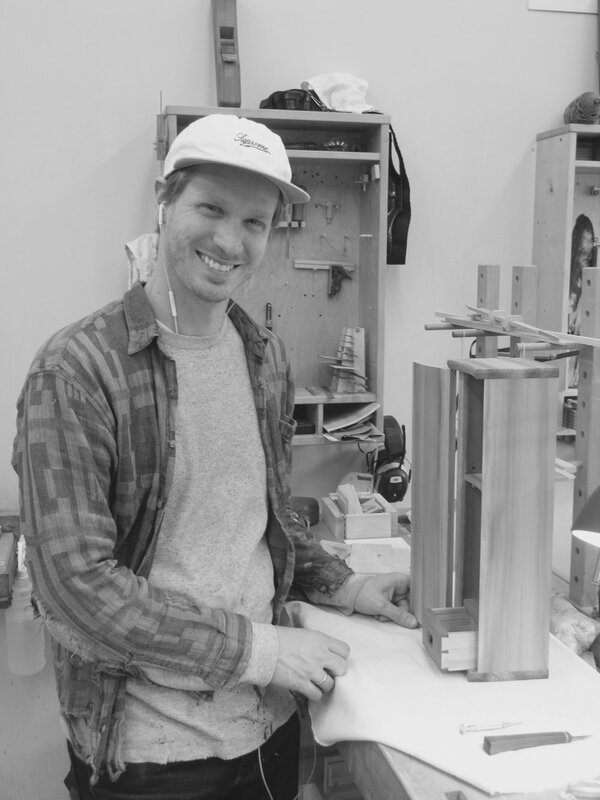 A few months later Andi, left Munich to join us for the first two terms of the Impractical Cabinetmaker Program, where in his second term completed one of the most ambitious Upward Spiral pieces to come out of the school. The truth is that piece has caused me nothing but trouble since, raising the bar for feasible second term pieces. 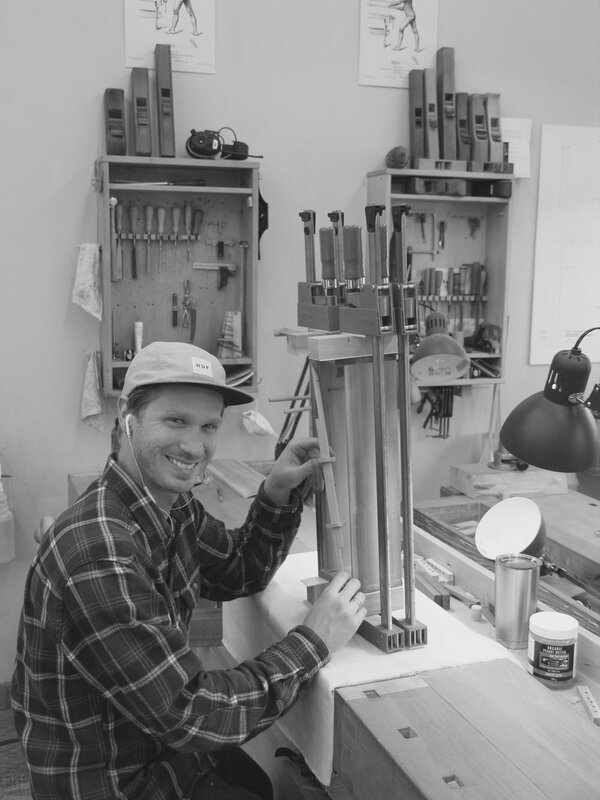 After his second term, Andi returned to Germany to set up his workshop and made several pieces before returning last May for what was was supposed to be two more terms, he ended up staying for a year. He has been an wonderful mentor at the school this term most notably Matt who had the pleasure of being his bench mate this past term. Matt mentioned to me more than once the influence Andi had on his work. During one of my final consults with Andi, I suggested to him that he was ready to go out on his own, that the yellow cedar is getting thin. We shared a laugh, as he immediately knew to what I was referring. 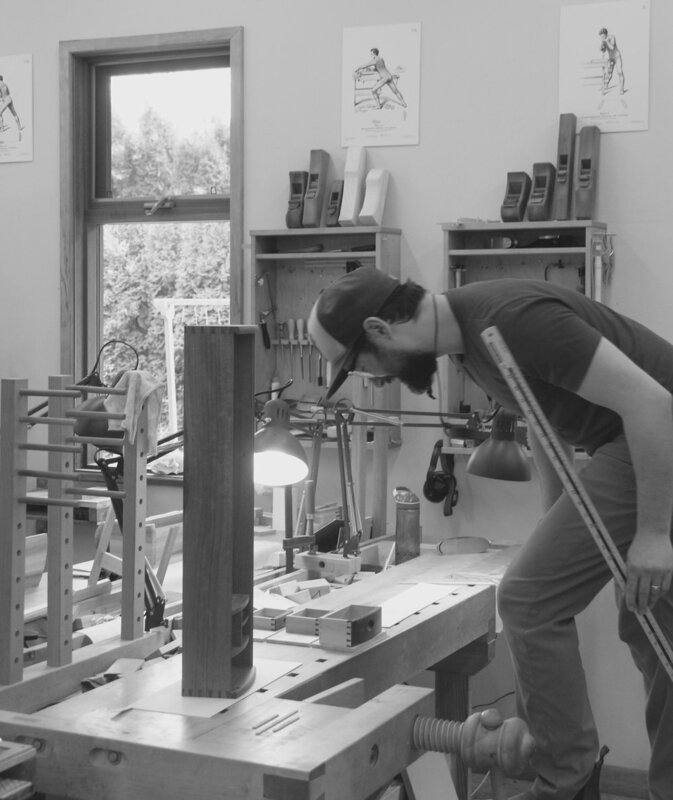 When he returned to the school last May for Vidars Chair, and then through each of his composing and residency terms that followed, he would arrive at our Saturday afternoon consult with a stick of yellow cedar and something to write with. He would take notes on the fine grained fragment wood, durning our consult, then later organize his thoughts in his notebook. In preparation for our next consult, he would take a few shavings from the yellow cedar, giving himself a clean slat so to speak. Over the months that followed, I noticed the piece of wood, with a couple of bandsaw kerfs on the one end was approach the thickness of a shop sawn veneer. 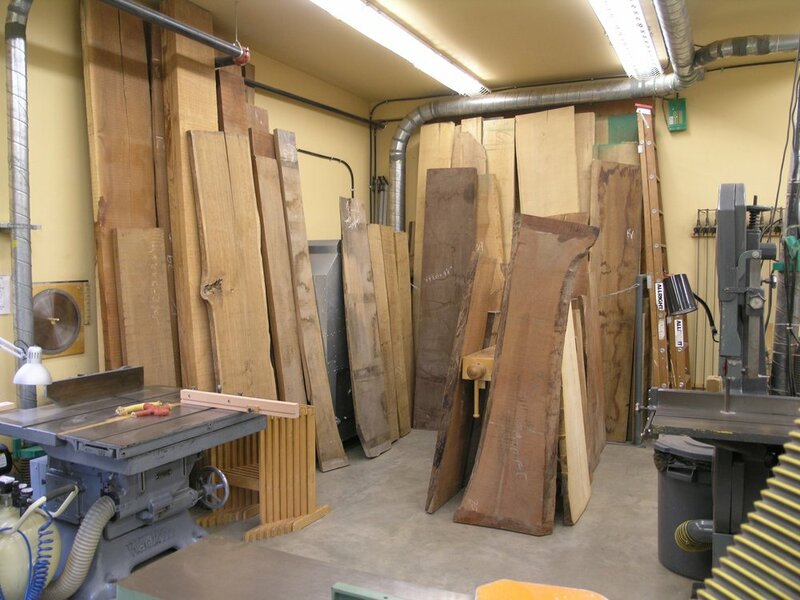 I’ll remember him fondly each and every time the fragrance of yellow cedar drifts through the workshop. I am coming up short on words to adequately express my gratitude for having the opportunity to work with such a fine young craftsman at the beginning of his journey. I will on this occasion, as I have in the past, defer those words to Jim’s. At each term end Elephant, we listen to one of the many farewell addresses Jim gave to my students. In one of those lectures, Jim relays a story, I have included it below. 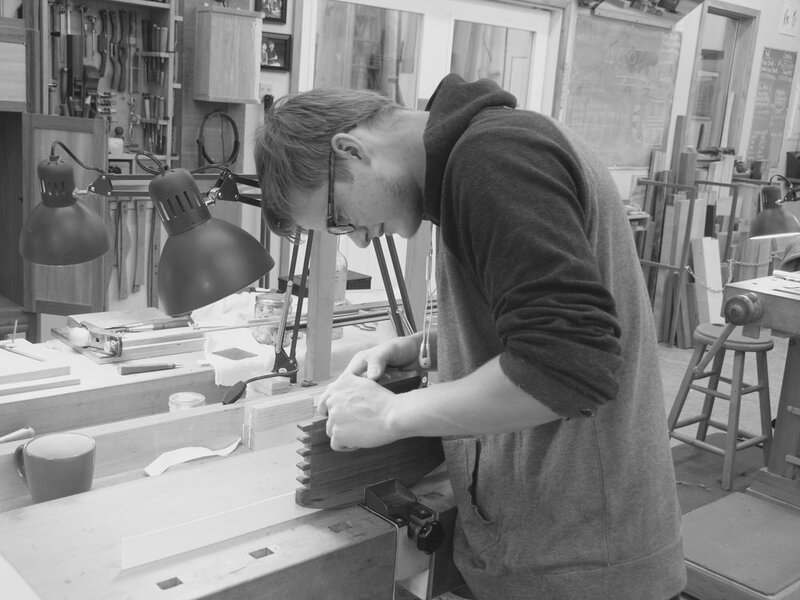 In each successive term of the Impractical Cabinetmaker program, students are gradually working towards working more independently. Andi and I spoke of this early on, and as the months passed our consults took the shape of him arriving and suggesting his next principle steps. Initially we would adjust them together, when I would suggest a change in the sequence or method. In the later consults there was less and less to adjust. As a teacher this is confirmation that the program is working. Our attention drew us more to the subtleties of the craft, and as I reflect back on all of the beautiful moments I have had as a teacher. I am not sure there has been anything that I have enjoyed more than my Saturday afternoon consults with Andi. Be well my friend and enjoy your work. In my last notebook entry I spoke of a wood run to the island, that Yvonne and I went on just before our spring term. The image above was taken the day we arrived home with a woodworkers lifetime supply of wood, and shows approximately half of our precious cargo. We came back with a very full cargo van filled with Pear, english brown oak, Andaman padauk, European sycamore, teak, Cuban mahogany, several pieces of massive genuine mahogany, English elm, tulip wood, Brazilian rosewood, ziricote, partridge wood and various other rosewoods, forty years of collecting wood. He has since bought a old wooden boat already keeping him busy. 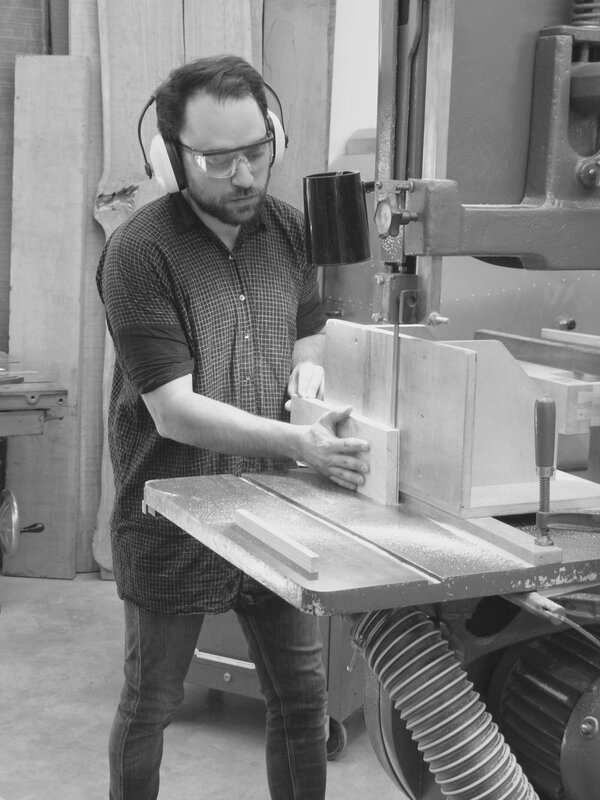 Ron joined us for a mid term elephant to share his thoughts on making a living at the craft. Ron was introduced to us by Geoff, a student, and friend, shown below who will be returning to complete his program this term. Kwila, was one of Jim’s favorite woods. It is an open grained wood, with grain similar to mahogany, but harder. Its colour varies from rich dark red brown to pail light brown. It it typically has yellow or even black specks, and is also known as Merbu. It is lovely to work with shearing tools but can be tough on cutting edges. When we opened the school, we purchased a thousand board feet of doussie and kwila combined. Over the past thirteen years, our stocks have dwindled, and it has become more and more difficult to obtain, especially with Canada’s very strict import restrictions. While it is not on the CITIS list as of yet, I suspect it will find its way there soon. A few years ago, while on a woodrun with students to Sydney on the island, I came across a couple of sticks. They were narrow, just seven inches wide, but long, fourteen feet, straight and rift to quarter sawn. I purchased them with stands in mind. Andi was immediately drawn to them and wanted to use them as the starting point for his final cabinet at the school. He worked much of the kwila with a high angle wooden plane, with a cutting angle of approximately sixty degrees. He was using Jim’s no glass showcase, featured in Worker in Wood as a starting point. The kwila would be used for the frame work, with complimentary woods used for the panels and veneer. At the time there was just one of the planks left and after carefully looking through the plank there would not be enough wood to build the piece, to the size of the original. I suggested to Andi that we could scale the piece down, or use a sacrificial wood and skin the rails. In the Details section below I will describe where it is useful and the process. 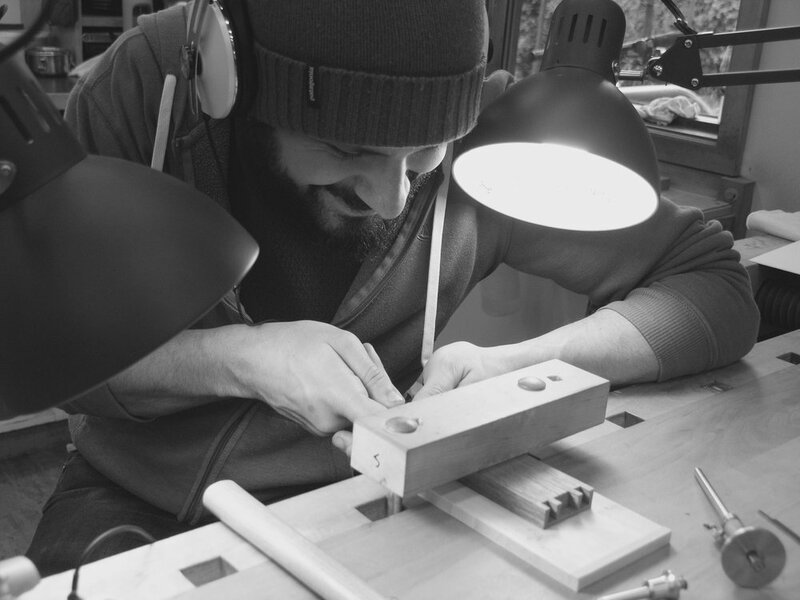 Matt used the same method when it came to one of the rails for his frame and panel back. I think for me what is most appealing about this method of work, is that, like shop sawn veneer, it stretches a precious resource. The image below, shows the teak rough sawn and shows the intimate relationship of what will become two doors and the sides of his cabinet. Watch for images of his lovely cabinet in next terms entry of the Teachers Notebook. This past term saw a few changes in my home workshop. I began by moving Jim’s jointer and planer adjacent to the bandsaw. I then moved Jim’s shaper and mechanical press where the jointer was. Jim’s original bench was then moved into the benchroom adjacent to my workbench. I made a small shelf that is mounted above his bench that houses fourteen of the more than two dozen drawers I have made as at the school in our Impractical Studies Program. 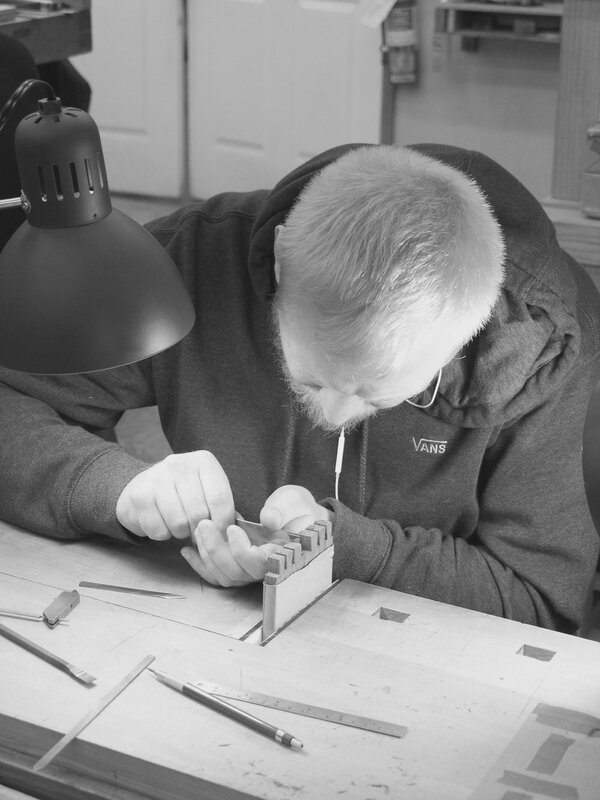 I am currently making a small rack that holds the last four planes Jim made, in various stages of completion. As the jointer is still not connected to power I came full circle dimensioning the pieces of the bandsaw with a plane. I told my students in the final weeks, that I was thinking of leaving it disconnected as it was bringing me back to the days when thats what I did, without access to a thickness planer. This past term, I also made a few things for our home, including the tea shelf above. The redwood came from Jim, the river redwood used in the panel/ shelf came from Monroe Robinson, when I was in school. The wall hangers came from Caroline who made them in her demo this past term. When I was in school, we used inserts to fit the mouth of our curved bottom planes. Jim had always done it this way, and the insert could be replaced as the sole wore over time. I remember arriving at school, with what I thought was a brilliant modification on one of my curved bottom planes, an adjustable mouth. 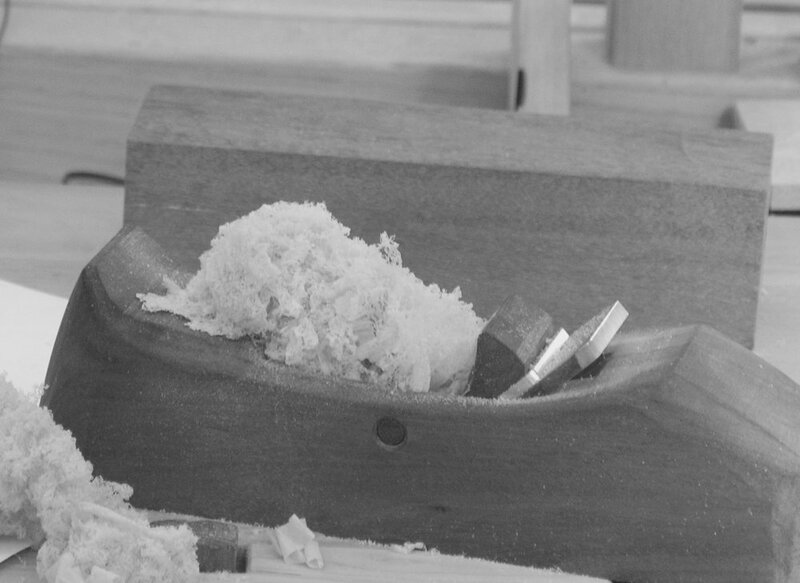 When rough shaping concave work, where significant material needed to be removed, I would open the mouth to facilitate heavy shavings, then closing it off when I wanted to dial in the final shaping and surface quality. When I proudly showed Jim, he seemed less than impressed so, I took it out and put an insert in. I have thought about revisiting this concept again, and still may at some point. Above images shows a few of my curved bottom planes. third from the front is one of Jim's earlier planes. The plane in the foreground is a plane of vera that is curved front to back and side to side. The second plane in is a plane of tulip wood with a modified one inch straight Hock iron. Over the years, we have also made our own irons from old files and breakers of spring steel, tool making and modification continues to be a ongoing activity at the school. Below is an image of some of Mario's efforts from this term. In the mean time, when we started making planes at the school, I explored another option. I decided to carefully pre-shape the forward ramp, before assembly. When I shared this idea with Jim, he approved, and we have been making them that way since. As the sole of the plane wears, an new insert can be added to extend the life of the plane. In the final week of the first term, after working exclusively with solid wood, students are introduced to real veneer as Jim discusses in The Impractical Cabinetmaker. While there are many benefits to working with shop sawn veneer, the one I would like to focus on is the stretching of a precious resource. Jim used to say that one of the reasons he worked in modest scale was that our material is precious and the most pieces of special wood are often small. He would say jokingly, that “Good wood doesn’t grow on trees!”. While I continue to use shop sawn veneer in my own work, and in our advanced programs at the school. Even when working in solid wood, there is occasion when we do not have quite enough wood to do what we want to do. When this issue arrises we skin the wood, that is we laminate a precious piece of wood over or around a sacrificial core that has similar seasonal movement characteristics. The thickness of these skins can be as thin as a shop sawn veneer to significantly thicker to facilitate shaping. Unlike veneer we have found that it is not necessary to balance the piece by applying to both sides. The skin is applied early on in the process, it is taken close to dimension and allowed the time to rest before taking down to final dimension and completing joinery. We have used this process in frame and panel where we can give ourselves a panel that is the primary wood on the outside and a lighter coloured wood in the inside to brighten up the interior of the cabinet. We have used it to create harmony grain in frame members and even drawer fronts. 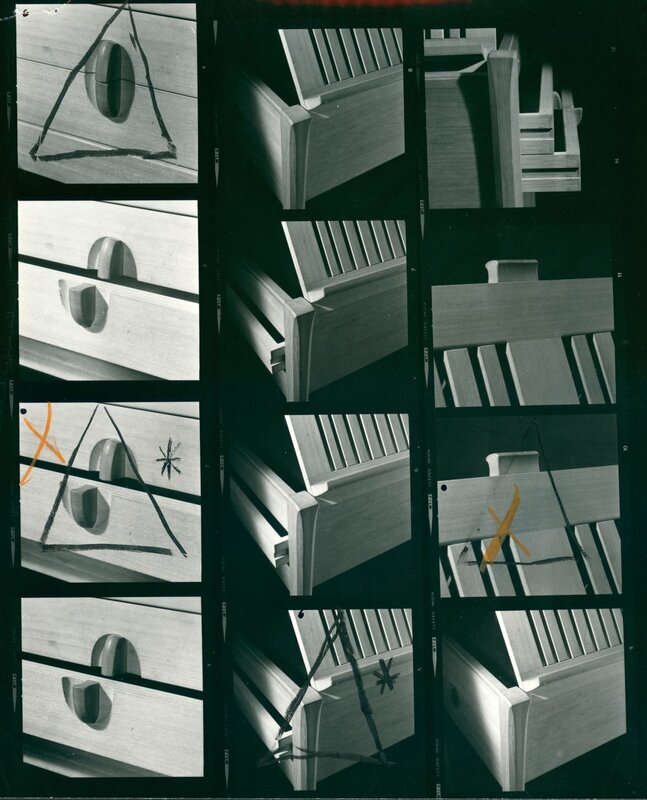 The James Krenov Archive is now available online. A few years ago, our small school passed along Jim’s archive of earlier work to Kevin Shea to digitalize. David Welter, the Archives curator said the final push took five months to complete. It is a real treasure, he, David Mathews, Jim son in law and Kevin Shea deserve all our gratitude in undertaking such an ambitious project. I would like to take this opportunity to thank the people who have made this school possible. To our students, this school not only exists for you, but because of you. Caroline, my student, colleague and friend. Michael Burns, Jim Budlong and David Welter, my other teachers at CR now The Krenov School. Jim and Britta, I dearly miss you presence, there is not a day that goes by that I don’t think of you both. And last but, certainly not least, soul mate, my partner in life and work, Yvonne, for continuing to carry the other end of the plank.